RMB Construction, LLC partners with the best people in our region to create the spaces you've been dreaming of. Quality construction and detailed finishes are the hallmarks of our projects. A refreshed mid-century modern home for a new family. A lovingly maintained mid-century home situated on an expansive lake lot was purchased by a young professional couple with a child on the way. The goal was to retain the character of the home's era while creating an open and light space suitable for a growing family. 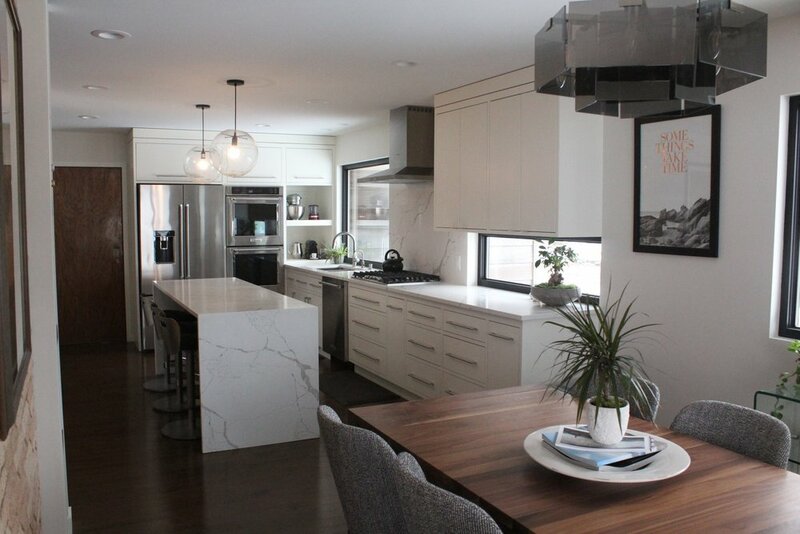 The kitchen, dining, and living areas were redesigned with the help of the owners, with much thought applied to materials, storage, traffic patterns, and views. The result is a fresh space that takes advantage of the outdoors, will function well for entertaining, and feels true to the home's vintage. A former bachelor pad is retooled for long term love. A happy couple, who own and run a business together, had lived for about a dozen years in a home that never had a true master bedroom. While the house has many lovely qualities, the time had come to create the master suite they longed to have for themselves. We worked with the homeowners to design a layout that maximized the existing space, reorienting the storage areas and the views, and only bumped out six feet into an existing covered porch, eliminating the need for a full addition. Within this footprint we updated a half bath, created a large en suite bathroom with large tiled shower, and gave them a walk-in closet. With the addition of two new windows, and a sliding glass door that provides access to a private porch, they now have a light filled master bedroom they can enjoy for years to come. The view from the bedroom entry to the new sliding patio door with flanking windows and private deck area. Master bath vanity with custom base and linen storage by Cutting Edge Cabinets, Inc. Custom tiled master shower with glass shower door. Client chose a teak bench for sitting and storage.